I officially entered agency life almost 15 years ago, long before that phrase “agency life” had been turned into a hashtag. While it’s no surprise that agencies have lost their luster to many, I am actually quite grateful for the experiences I have had. I’ve worked with incredible people, laughed a ton, learned quite a bit and overall really enjoyed the ride. So you may be thinking, understandably, that I simply favor a start-up as the next chapter of a casual, fun work environment — a job where you are free to act only somewhat grown up. Looking beyond the stereotypes of both agencies and start-ups, the real answer is a bit more complicated. Before I ever considered a career in advertising, I had been an aspiring screenwriter in Los Angeles. Admittedly this stage of my life might indeed fit the stereotype . . . to a point: I would stay up late into the night, downing coffee and typing furiously away on scripts. I had an agent, a cramped apartment where you could see the Hollywood sign when the smog cleared, and every once in a while I scored pitch meetings with executives at various movie studios, which seemed impressive at the time. Yet the truth is that it was an unsettling existence, and it wasn’t exactly paying the bills either. After I graduated from the University of Southern California’s film school and needed to pay back my student loans, I found work as a freelance producer on a series of projects at a commercial production company. It was then I actually began working with agencies, as they would hire us to execute the vision they had sold to their clients. I quickly realized that was where the real fun existed. People at agencies were solving their clients’ business problems through the strategic use of storytelling. I moved back to the Midwest, where I had grown up, found work at a small agency and began building my career from there. I have now worked at four agencies, ranging from independent boutiques to global networks. It is not a business for the faint of heart, nor is it an industry that I believe will survive much longer in its present form. My previous agency was acquired not long ago, toward the end of 2016. Earlier in the year, as the deal-making gained traction and I began working through the integration of operations between the various offices, I was offered a larger role within the acquiring company. I had a solid relationship with my current employer and had forged a good, collaborative partnership with the new owners as well. Yet the landscape was changing. The exercise of looking at our two merging companies gave me a chance to press pause and consider how I wanted to evolve my career from there. Agency life had grown familiar, comfortable even, but the dynamics within the industry were hurting our chances of making a significant impact on our clients’ businesses. At some point, on one of the many flights between our office in Chicago and theirs in New York, I realized any form of complacency wasn’t a good career path. I wanted a new challenge. Indeed, it was time for a change. An old friend, roommate and fellow struggling filmmaker during the Hollywood days of my early twenties had a phrase he would use to describe our lives back then: “the tilt-a-whirl.” He felt our emotions would too often be driven by the pressures around us, either validating our dreams if we scored a new meeting or received positive feedback on a script — or destroying our confidence if we experienced the inverse. It wasn’t fun to be stuck on the tilt-a-whirl; it made us feel helpless. There was nothing to drive own own fulfillment but the validation that would hopefully be granted by forces beyond our control. I believe this unfortunate situation is exactly where many ad agencies have now found themselves. In the late 1990s, Harvard Business professors B. Joseph Pine, II and James H. Gilmore introduced the “progression of economic value,” which I believe explains the tilt-a-whirl effect in more concrete terms. At one point agencies existed in the upper right hand corner of this chart, providing relevant, differentiated and valued services that brands needed in order to grow. 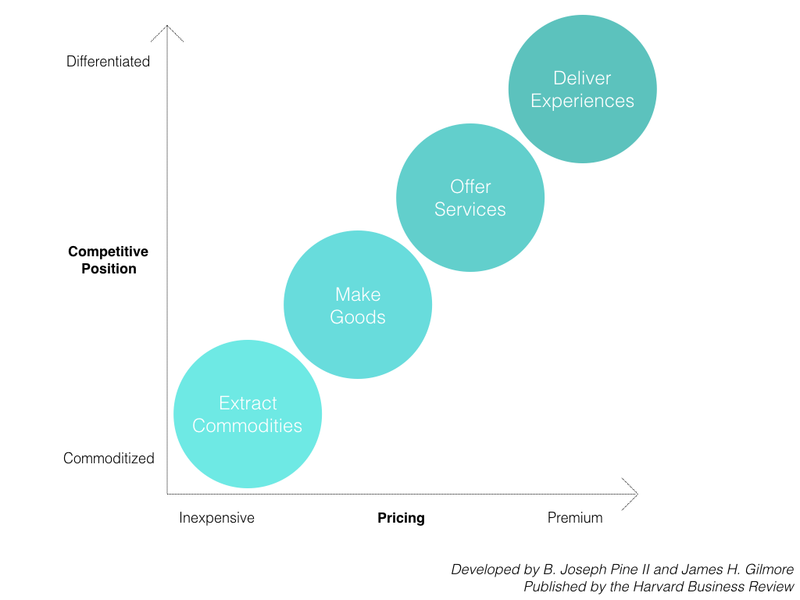 Over the past couple of decades, however, the subjective nature of nurturing creative ideas and the relentless need businesses have for real-time, data-based results have been in juxtaposition of one another, forcing agencies to drift left and downward, their product becoming less valued and their pricing model under increasing market pressure. The tilt-a-whirl effect takes hold as a natural symptom of this commoditization of creativity, and it begins to erode the culture and success of the companies that experience it. When you’re on the tilt-a-whirl, you doubt yourself too often; you base your self-worth on the opinions of others, and that forms a vicious cycle of decline. In other words, when your financial success solely rests on what a handful of others subjectively think of your work, well, over time that becomes a bad business model. Start-ups, on the other hand, like the one I joined a few months ago, have an undeniable need to burst to life on the top edge of the economic value chart, as far from the standard and commoditized as possible. They must be disruptive. They must be transformative. They must uniquely position themselves against category leaders and reimagine solutions. Think of some of the successful start-ups that have rocketed to prominence in the last several years. Airbnb. Snap. Tesla. They have radically and rapidly redefined consumer expectations. So while most agencies have relied on providing services that disrupt the consumer experience to deliver a brand message, today’s innovative companies are disrupting the categories themselves to provide a better experience for people. Tesla, for example, has never created anything that could be remotely considered traditional marketing communications. Instead, Elon Musk and his team have focused those resources on bringing to life a suite of incomparable products and a possible future of sustainable energy. At the time of posting this, the company’s market capitalization is over $50 billion, greater than Ford or GM. Admittedly, most start-ups will never grow into a full-fledged unicorn, yet the possibility of delivering groundbreaking innovation is a stirring call to action within the companies that attempt such disruption. It is this challenge — to defy the status quo and help build a transformative solution — that has called to me, and that is an opportunity you will unfortunately no longer find at most agencies. To demonstrate my point, of the 50 companies on Fast Company’s 2017 list of “The World’s Most Innovative Companies,” not a single one of them is an ad agency. Nor will you find one on the 2016 list. If you look back a full two years to their 2015 list, you will see only one, 72AndSunny. To be sure, there are still great agencies. There are talented, smart people who work for agencies, many of whom I consider good friends, and I would relish the chance to collaborate with them again someday. Yet it is an industry drifting toward the precipice. Ultimately, agencies are under market pressure on both sides. Firstly, there is a growing set of competitors. Business consultancies, such as Deloitte and Accenture, as well as media platforms, such as Facebook and Google, are developing creative services and acquiring tremendous talent. Secondly, marketing budgets are contracting at many companies with growth slowing worldwide for overall global marketing spend. The end result is a shrinking pool of revenue being pursued by a growing set of well-capitalized competitors — and a very subjective value placed on the end product. All of that is a recipe for upheaval and, if the industry is to survive, wholesale reinvention. So undoubtedly, the format of a modern advertising agency will be re-defined. That itself is an admirable challenge, I’ll admit. After all, agencies can still offer something businesses absolutely need: fresh ideas. However, they must be delivered in a very different manner to drive the industry forward once again. In the meantime, my focus is on dramatic innovation, for my wife and daughters, for my own career and for the overall business landscape. Someday perhaps I’ll return to agency life. For now there is just too much else to learn, too many other great challenges to tackle as we work to build this upstart company I’ve joined. There is a wide-open field of opportunity to be explored in the start-up world. For now I’m trading #agencylife for #startuplife. Matthew Witt (@MatthewWitt) is the Chief Marketing Officer of M1, a fintech start-up based in Chicago and focused on rethinking personal money management to design and build an entirely new set of financial services. Strategic Brand Storyteller for the Digital World: I use data, design and content to build businesses of the future.